RoomSmart’s Forge Collection combines utilitarian style with beautiful contemporary design. Each piece has dark, burnished metal tapered legs that contrast with the lighter oak veneer finish of the hardwood furniture. The veneer is perfect for often-used surfaces like the dining table or coffee table, because it resists water rings and stains, as well as nicks, scratches and dents! 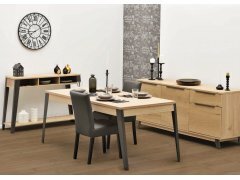 The Forge style encompasses both dining room and living room furniture, so it’s easy to mix and match the exact pieces you need for your unique room layout. If you have a great room or open living/dining area, you can create a matching combination for your dining table, sideboard, coffee table, TV table, and an accent chest that could go in a hallway, against a wall or behind your sofa. The dining table has built-in extensions, so you can keep it smaller for family and extend it for guest seating. The sideboard, chest, coffee table, and TV table provide lots of places to organize and store your dining room and living room essentials, so you’ll always know where to find what you need! The Forge Collection- Versatile-Functional-Beautiful!